The team surveyed bees in 27 orchards in New York for over 10 years, identifying over 8,700 individual bees. We’re not talking domesticated honey bees — they found an amazing 88 different species of wild native bees. Over those years, they watched the landscapes around the orchards become more and more cultivated. Natural spaces like woodlands were replaced by alfalfa, corn and soybeans. And they saw fewer and fewer bee species in the orchards as the habitat around them disappeared. Then they sequenced the genomes of all the species to make a phylogeny — an evolutionary family tree — to see how related the different bees were. They learned that the species that disappeared weren’t a random pick from the 88. Instead, the species lost were closely related to one another. Likewise, the species left behind were closely related to one another. Habitat losses had led to entire branches of the tree of life being pruned away — meaning phylogenetic diversity took a major hit. 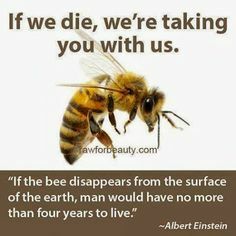 The researchers estimate that for every 10 percent of land area that gets converted to agriculture, 35 million years of evolutionary history are lost from the bee community. They found that the number of bee species didn’t matter for pollination. But the phylogenetic diversity did. Their giant dataset allowed them to learn that although more agriculture in the landscape decreases both, the latter is what really hurts the fruit. Cutting away whole branches from the tree of life hurts the whole ecosystem. 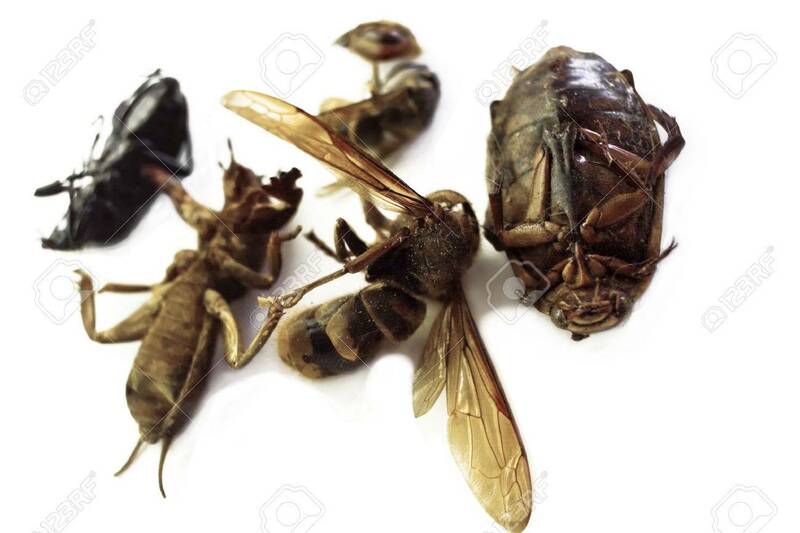 ......Lister calls these impacts a “bottom-up trophic cascade”, in which the knock-on effects of the insect collapse surge up through the food chain. I find it rather suspect to conclude that the most likely culprit is global warming, especially considering that the temperature in the study area has actually show a slight decline over the time frame mentioned. I tend to agree. This is just waving over our ignorance. Can't find the reference now, but I read in some article on this topic a scientist saying "there's no obvious smoking gun". If I was researching this subject, I would look closely at the global diffusion of many molecules known as potential endocrine disruptors. Insects behaviour, including mating, relies heavily on chemical signals (e.g., pheromones) acting at very low concentrations, which can be blurred by the presence in the environment of similar molecules. Just an idea. “If you go a little bit past the thermal optimum for tropical insects, their fitness just plummets,” he said. However it is a problem that this is just two snapshots. 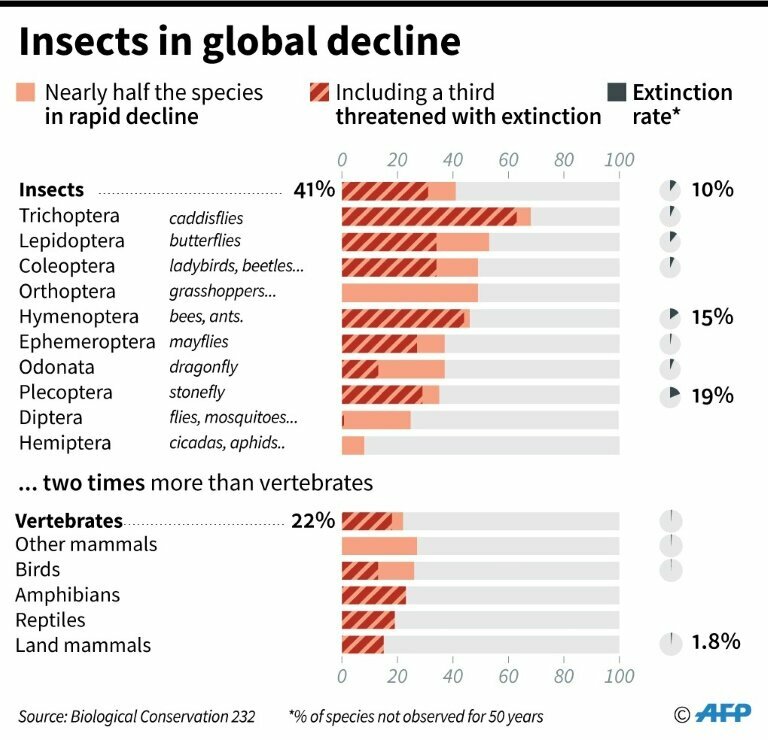 We don´t know what species started disappearing at which years so all we have left is a scary number. Then again someone else must have done some insect counting there in all the time in between. Then the question is - will the insect population recover? If yes, could be the hurricane. Recovery should be quick. If not, another nail in our coffin. Daily average by year (for the last 40 years) of minimum, maximum, and average temperature values, in urban and rural locations of the northern coast of the island of Puerto Rico. The solid, broken, and dotted lines represent the projections for minimum, maximum, and average temperatures, respectively. The new analysis selected the 73 best studies done to date to assess the insect decline. So what is going to do for us? - collapse of the ocean web of life? - pick'n'mix of the above and all sorts of other screw-ups? - the effects will continue for n years, where n has a few noughts on the end of the number. No. All you have to do is wander through the highways and byways of this forum and there it is for all to see. The destruction of the holocene climate caused by GHGs is far less easy to see, to intuit, than the destruction of life caused by drenching the land (and our food) with poisons. Yes, Rachel Carson warned us very clearly, but honestly, what kind of idiot really thinks that literally spraying poison on fields and forests is a good strategy for survival? Why do we even need to argue this still? Why are these poisons still even legal? But researchers say that some species, such as houseflies and cockroaches, are likely to boom. "It's quite plausible that we might end up with plagues of small numbers of pest insects, but we will lose all the wonderful ones that we want, like bees and hoverflies and butterflies and dung beetles that do a great job of disposing of animal waste." Brazil's cities provide an excellent habitat for scorpions, experts say. They offer shelter in sewage networks, plenty of water and food in the garbage that goes uncollected, and no natural predators. ... Scorpions, like the cockroaches they feast on, are an incredibly adaptable species. As the weather in Brazil gets hotter due to climate change, scorpions are spreading across the country – including into its colder southern states that rarely, if ever, had reports of scorpions prior to this millennium. ... the species terrorizing Brazilians is the highly poisonous yellow scorpion, or tityus serrulatus. It reproduces through the miracle of parthenogenesis, meaning a female scorpion simply generates copies of herself twice a year – no male participation required. Each parthenogenesis can spawn up to 20 to 30 baby scorpions. Brazil's urban scorpion infestation is the result of poor garbage management, inadequate sanitation, rapid urbanization and a changing climate. Life's a laugh and death's a joke it's true. You'll see it's all a show. Keep 'em laughing as you go. Just remember nature's last laugh is on you. Always look on the right side of life. So I will need cats for the rodent control and scorpions for the cockroach control. Will just have to remember to look inside my shoes before I put them on. ... Some of the members of the European parliament’s agriculture committee are themselves farmers who have grown increasingly dependent on powerful and toxic pesticides. 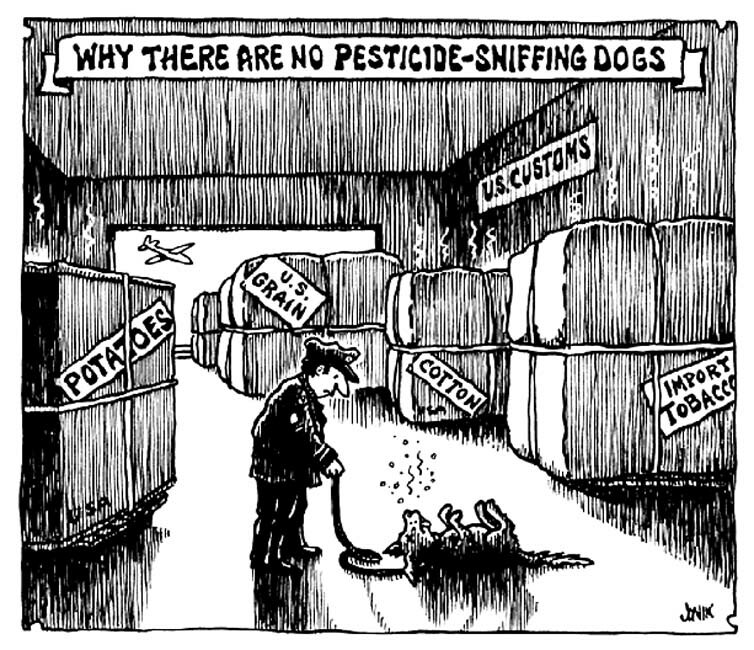 But others have taken the agribusiness shilling and believe that their role in policymaking is simply to support the corporations that sell these poisons. 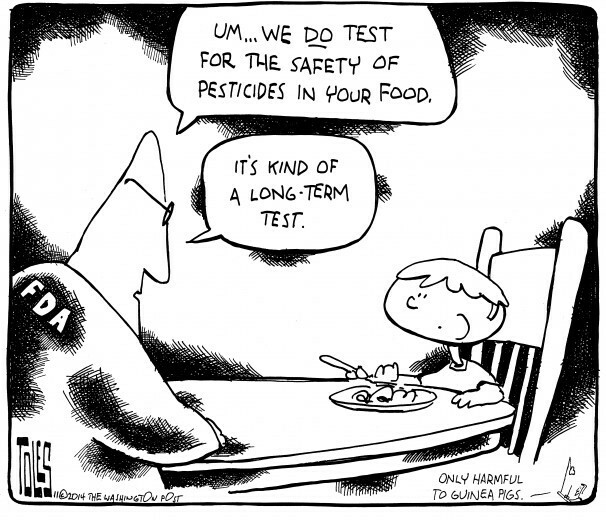 ... the agrichemical industry is literally writing pesticide assessments that are then presented as the work of regulators. For example, a recent report exposed how EU regulators based a decision to relicense controversial glyphosate on an assessment plagiarised from industry reports. Around 50% of some chapters were actually a copy-and-paste job from papers Monsanto and other agrichemical corporates had written. The European Food Safety Authority (Efsa), based its recommendation that glyphosate was safe for public use on this industry assessment. ... Tearing apart the web of life damages us all. Only a farming system that views itself as part of this web has a long-term future. just to remind you that the killing of people in the millions is not next but is an ongoing truth for thousands of years. only because it currently does not happen on big scale where we live does not mean that it does not happen at all. in short, we are not only next but are right now and in the past. A record 1.75 million Bavarians signed a petition to seek a referendum to "save the bees," a move that could have huge consequences for the German farming industry and environmental protection. The proposal for a vote to protect species diversity sets a target to have 20 percent of farmland meeting organic standards by 2025, before reaching 30 percent by 2030. Ten percent of green spaces in Bavaria should also be turned into flowering meadows, while rivers and streams must be better protected from pesticides and organic fertilisers. ... U.S. Customs and Border Protection (CBP) designs indicate that the wall will extend to the height of an existing flood control levee next to the Rio Grande river, and be crowned with 18-foot steel posts. CBP also intends to clear a 150-foot “enforcement zone” in front of the wall. Seventy of the National Butterfly Center’s 100 acres will lie south of this new barrier, as will much of the land belonging to the Bentsen-Rio Grande Valley State Park, which is home to more than 500 bird species, according to Waters. ... the center said that a police officer told them they would not have access to this land, and that the authorities were ordered to stop anyone who tried to set foot on the levee. “Effective Monday morning, it is all government land,” the officer reportedly said. For the first time, researchers applied a biomedically inspired approach to examine changes in the 12,000 genes that make up bumblebee workers and queens after pesticide exposure. The study, published in Molecular Ecology, shows that genes which may be involved in a broad range of biological processes are affected. They also found that queens and workers respond differently to pesticide exposure and that one pesticide they tested had much stronger effects than the other did. Other recent studies, including previous work by the authors, have revealed that exposure even to low doses of these neurotoxic pesticides is detrimental to colony function and survival as it impairs bee behaviours including the ability to obtain pollen and nectar from flowers and the ability to locate their nests. Open Access: Thomas J. Colgan, Isabel K. Fletcher, Andres N. Arce, Richard J. Gill, Ana Ramos Rodrigues, Eckart Stolle, Lars Chittka and Yannick Wurm, 'Caste- and pesticide-specific effects of neonicotinoid pesticide exposure on gene expression in bumblebees', Molecular Ecology 2019. ... The research, led by the Centre for Ecology & Hydrology, measured the presence of 353 wild bee and hoverfly species across the country, from 1980 to 2013. It showed one third of species experienced declines in terms of areas in which they were found, while one tenth increased. For the remainder of species, their distribution was either stable or the trend was inconclusive. Researchers from the University of Neuchâtel, Switzerland have developed an ultra-sensitive method to quantify extremely low concentrations of neonicotinoid pesticides in honey. This is a follow up to their study on the global contamination of honey by these pesticides published in the Journal Science in October 2017. The authors, which also include colleagues from the Botanical Garden of Neuchâtel, found that these pesticides did not degrade in honey over a period of 40 months. These results were published in the journal Environmental Pollution. The long-term stability of these molecules is worrying: "if these pesticides are brought back to the hive with nectar, this implies that the entire colony, including the queen, is exposed during its entire life to these neurotoxins", points out Blaise Mulhauser, director of the Botanical Garden of Neuchâtel. "Likewise, the concentration of these pesticides will be stable over a period of several years also in honey destined to human consumption"
... Fish and Wildlife Service analysis found that two of the pesticides, malathion and chlorpyrifos, were so toxic that they “jeopardize the continued existence” of more than 1,200 endangered birds, fish and other animals and plants, a conclusion that could lead to tighter restrictions on use of the chemicals. ... A Dow spokesman said the shift in policy was unrelated to the $1 million contribution to Trump’s inauguration committee. What is narrower than extinction? But one species is thriving: the European spruce bark beetle (Ips typographus). Today it was on the evening tv news here in Sweden: because of last year's heat and drought there are now infestations with this insect that are difficult to contain. It is causing great economic damage in forestry. Americans love a winner, so we join whatever bandwagon is around. In February, backers of the plan collected nearly 1.75 million signatures, over 18% of the region's electorate and enough to force a vote. It would set aside more space to protect imperiled insects and banish many pesticides from a third of Bavaria's agricultural land. ... there would be payments to farmers to cushion the impact. Potentially good news there Vox! By eating less meat and paying farmers to give land over to nature I think we humans can really significantly lessen the burden on insects, indeed on all sorts of creatures. All around where I live is open moorland (see photo), whose only agricultural value is for grazing a small number of sheep - yet those sheep mean there are no trees and very little else for miles at a time. Sheep farming in such areas (Im in the UK by the way) is not profitable and is subsidised heavily by the government; I do wonder whether some farmers might be willing to be paid instead to oversee the restoration of this land? There seems to be an attachment to preserving things "as they are" in nature orgaisations here, rather than seeing that the land is in a bad state which is not natural. Trees, birds, animals, insects. It can be done I'm sure. Rewilding needs to happen. There is increasing local pressure in Mid Wales for rewilding as well, ideally to create an equivalent to the Caledonian forest. The sheep-wreck covers almost all of the high ground at the moment, and I completely agree with you, josh-j about the concept of subsidising farmers to produce something other than sheep, or at least changing the system radically to allow large chunks of upland to rewild. Something Brexit might (possibly) end up being good for! One thing to bear in mind for insect diversity is that total forest coverage isn't as good as some might think. I did some surveys for Trees for Life in the Scottish Highlands a few years back, and one of the key points was that it is the mosaic landscape that is insect-rich. Blanket forest is better than blanket moor, but the real diversity comes in where you get sheltered clearings, gradients in temperature and moisture, pockets of different vegetation, and patchiness overall. To keep that, of course, you need a sustainable population of herbivores... and for those to be managed by specialist predators. Part-measure rewilding is only of very limited use, I fear, but when it's done well, there's no reason that it can't work. ... Trees, birds, animals, insects. It can be done I'm sure. Rewilding needs to happen. I agree. See the article below on China,s effort to integrate nature into commercial agriculture. ... one of the key points was that it is the mosaic landscape that is insect-rich. Blanket forest is better than blanket moor, but the real diversity comes in where you get sheltered clearings, gradients in temperature and moisture, pockets of different vegetation, and patchiness overall. Exactly. This is a fundamental concept in permaculture - that edges between two environments are the most biodiverse and productive. And maximizing edges - like a mosaic- maximizes biodiversity. Shrinking bee populations around the world have caused scientists and conservationists to sound the alarm over the effects of intensive agriculture, disease and pesticides. But not in Cuba, a Communist-run island nation that has become a kind of apicultural paradise, thanks to the purity of its countryside. That environmental integrity dates back to Cuba's crippling economic crisis of the 1990s, following the collapse of the Soviet Union, which once provided the island with thousands of tonnes of pesticides, fertilizers and herbicides. Deprived of that support, Cuba had no choice but to develop natural alternatives. In the process, it reduced to almost zero the use of chemicals, so harmful to bee populations and the quality of their honey. Average production is 51 kilograms (112 pounds) of honey per hive, a level considered high. ... some show yields of up to 160 kilos of honey per hive—triple the national average. ... "We don't use any chemicals when fumigating apiaries or weeding," and "no antibiotics"—products that are anyhow hard to come by because of the US trade embargo in place since 1962.